According to legend, the seven islands that make up the Tuscan Archipelago were gems in Venus’s necklace that fell into the Tyrrhenian: today they are a true natural paradise, cared for thanks to the Arcipelago Toscano National Park, which covers a stretch of sea over 600 square kilometers between Livorno and the Argentario promontory. 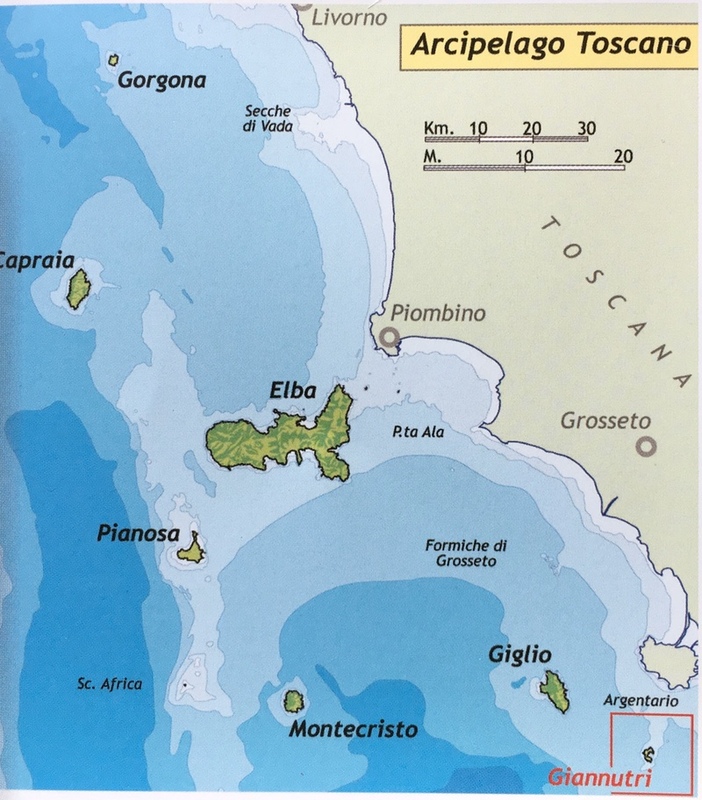 The largest island is Elba, an authentic mineralogical paradise: 150 varieties of its crystals are held in natural science museums around the world. With its triangular shape dominated over by the thousand-meter high Mount Capanne, the island is rich in gulfs, coves and hiking paths all waiting to be explored. The Butterfly Sanctuary is a must-see, located on Mount Perone, on the road between Sant’Illario and San Piero in Campo, where you can admire 50 species of butterflies, including the rarest varieties. The second largest island in the Tuscna Archipelago, directly opposite Monte Argentario, surrounded by clear, emerald-coloured waters, the beautiful Isola del Giglio rises from the sea, renowned for being a nature-lover’s paradise. Giglio takes its name from the Greek word aegilion, "island of goats", most likely because of the mountainous terrain – almost entirely made of granite – populated with kestrels who prey on cliff-dwelling animals. Today, the population is concentrated around Giglio Porto, Giglio Castello and Campese. Giglio Porto is a picturesque harbour nestled in a cove surrounded by two wharfs and a hillside amphitheatre divided into terraced vineyards. From here, a narrow and winding road leads to Giglio Castello, seat of the town council, which also presides over Isola di Giannutri. The ancient town has preserved its fortified village appearance, with its surrounding high Medieval walls and towers and labyrinth-like streets covered by arches, dark underpasses, steep staircases carved out of the rocks and old houses leaning against each other, dominated over by the high-rising Rocca. On the western coast of the Island is Campese, the main holiday destination located at the center of a bay with an extensive golden beach, made even more beautiful by the presence of the imposing Tower erected during the rule of Ferdinando I. Famous for its clear water rich in marine life and much beloved by scuba divers, where amidst thriving meadows of posidonia and vertical walls covered in blue sponges and red gorgoniidae you can also catch a glimpse of sea horses. The island’s beautiful coast is jagged with by steep but smooth cliffs (perfect for laying out under the sun or spending a pleasant day on the shore). The island’s flora and fauna are also interesting. The thriving Mediterranean scrub has built-in ancient terracing so the land can be cultivated to grow olive groves and vineyards. Indeed, the exquisite white wine Ansonica is made here. Giglio’s pleasant mild climate makes the island a good place to visit outside the summer season as well. From the time of Italian Unification to 1998, Pianosa was the seat of a maximum-security prison and for this reason, it has remained largely untouched. Today, it is open to limited guided visits, with hiking excursions and snorkelling to discover the island’s treasures. Giannutri emerges from the sea like a limestone half-moon: 11 kilometers of rocky coast and a seabed rich in biodiversity, teeming with dolphins and rorqual whales, not to mention the splendid archeological site of the Roman Villa Domizi, built by the Domizi Enobarbi family. The public can access the island only in the summer season, when some shops and restaurants are open. Capraia is the third largest island in the Archipelago and the only one with volcanic origins, born nine million years ago from an underwater volcano. Regarding its plant life, the island is a true natural laboratory, with over 650 plant varieties including the Capraia centaurea, a type of cornflower, while the waters around the island are rich in marine life and the sea bottom is famous for snorkelling and scuba diving: amidst meadows of posidonia, sea anemones and sponges, you can observe large groupers or greater amberjacks. Gorgona is the smallest island in the Archipelago and the home of a farming penal colony. For this reason, it is totally managed by the penitentiary administration, who authorizes excursions with up to 75 visitors per day for 4 days a week according to an agreement with the Park Authority. Visits are possible only in small groups accompanied by a guide certified in nature excursions. Montecristo is a true natural paradise, where thanks to the protection measures in place covering a mile around the island, the marine life is particularly lively and intact. As such, whales and other cetaceans can be seen in the area, including the rare beaked whale. To protect this oasis, only one thousand people are allowed to visit Montecristo per year on a nature excursion and in the company of the State Forestry Corps, but it is not possible to go swimming. Given the high number of requests, long waits are not uncommon to see the most mysterious island in the Archipelago.